Here are my basic charts for Eli (top) and Catherine (below). You can click on the image to get a better view if you need to. In the left columns, I try to list the various names used by the individual and common alternate spellings. In the event column I list the main vitals of birth, marriage(s), death. The next column has the year I found for the event followed by simple notes, if I have confirmed the date with historical documentation, and the place where the event took place. The last column on the right is where I assign my priority level. When I look at Eli’s chart above I can see that I have not confirmed any of his dates with documentation and I only have him located in one census. I do have an estimated date and place of birth as well as an actual date and place of death but these still need to be confirmed. Once I have an idea where a person was born, married, and died, I list all the census records (in chronological order) that might exist for his possible locations and time period. 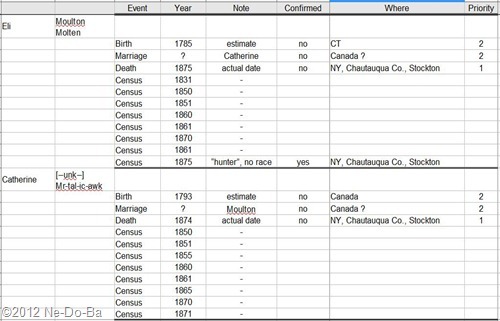 Using Eli as an example, I know he was in New York and Canada, so I list all US, NY State, and Canada census that are available during his life time. As my research progresses, I will go down this list and attempt to locate him in these census. When compiling my list of census to be searched, I need to keep in mind which years the census will not list the women and children of the household. For example, U.S. Census only list heads of household prior to the 1850 Census. It would be a waste time to look for an eight year old child in the 1840 Census. I might find Eli in the 1830 census since he was an adult and could have been a head of household. However, I know I will not find Catherine listed in the 1830 Census, so it would be a waste of time to look for her there. I really have not attempted to research Eli and Catherine Moulton much. Spending time randomly searching for this couple is not a good use of my research time. I simply do not have enough information to sort him from the half dozen or so other Eli Moulton found in the northeastern regions of North America. It is a common name! Looking at my charts, I see that I have actual dates and locations of death for both Eli and Catherine. My priority for this couple needs be be locating those death records. The records may provide me with the clues I need to move forward (backwards in time ;) ) with my research. These records are not available online, so I will need to hire a researcher to locate them for me. I plan to use the GenealogyFreelancers service to locate and hire a researcher. If any reader would like to help with these costs, you can donate using the PayPal “Donate” button at the top right of this post. All donations are completely tax deductible. Next is the chart I used to determine where I might look for birth records. At this point I only have the responses given in the census records where Eli appeared and his potential children (Marleah & Lee-o-netto) list the birth place of their father. Census are not real good indicators of true birth locations so I will wait before trying to locate birth records. Marleah appears consistent, but I have no way to know if she or someone else in the family provided this info to the census taker. At least Connecticut is a place to start. Lee-o-netto’s census has a different location. This is perhaps evidence she may not be a daughter of this couple. Again Marleah appears consistent in identifying the birth location of her mother. I can see that Lee-o-netto believed both her parents were from Canada. English Canada generally refers to Ontario. Here is another useful chart. It shows the age of Eli & Catherine at the time Marleah and Lee-o-netto (elder) were born. The parents were middle aged when Marleah was born. If this is a first marriage for Eli & Catherine, I suspect they had a number of other children born before Marleah. An age of 53 for Catherine at the time of Lee-o-netto’s birth, makes it unlikely they are mother and child. Since these ages are based on unconfirmed birth years, this could change once I have better documented ages. Obviously, I will not be able to search for Catherine’s birth record until I know what her maiden name was. Finding a marriage record should provide her maiden name. Marleah (their presumed daughter) always refers to her birth location as Canada, suggesting Eli & Catherine were in Canada in 1826 when Marleah was born. This is a likely place to look for the marriage of Eli and Catherine. But Canada is a very large place. I need to narrow things down a bit before I begin this search. Before this research project is complete I will need to locate marriage and birth records for this couple and their children, but that will have to wait until I have a better idea of where to look.